The setting was drab: a cramped room attached to a warehouse filled with boxes of paper and filing cabinets. And the arguments about drilling technology, mowing plans and legal minutia were often tedious. Yet the Public Service Board hearing last Thursday turned out to be high drama. The three appointed arbiters — Margaret Cheney, James Volz and Sarah Hofmann — slipped in from the warehouse and sat behind a table at the front of the room. The space could only accommodate a fraction of the attendees. A Department of Public Service attorney, Louise Porter, turned around to take stock of the reporters behind her. "I didn't know there were this many news organizations in Vermont," she said. Outside, protesters lay sprawled out on the blacktop, their bodies cloaked in white sheets and faces painted a chalky white. 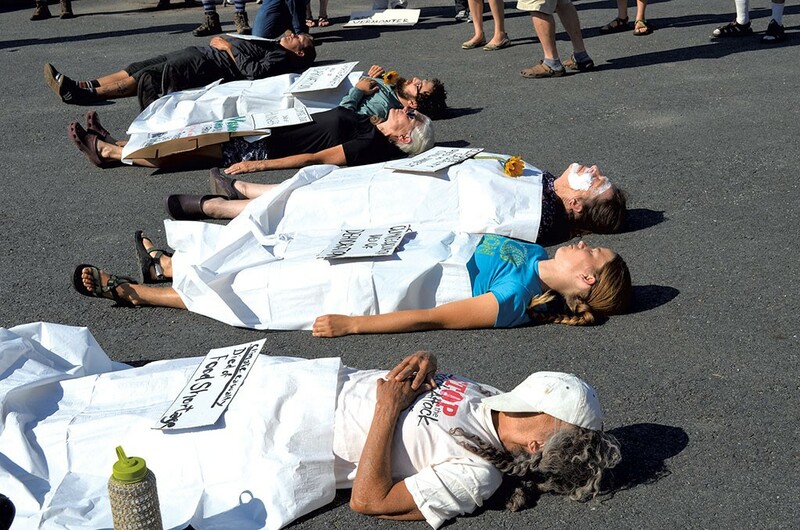 At least five cops stood by during this "die-in" intended to symbolize the casualties of climate change. Vermont Gas Systems was seeking permission to use eminent domain in Hinesburg's Geprags Community Park. It's the final right-of-way the utility needs in order to complete its 41-mile natural gas pipeline from Colchester to Middlebury. "This is the last piece of the puzzle in our effort to being able to complete the pipeline," Vermont Gas president Don Rendall said after the hearing. But even if the PSB rules in the company's favor, the battle likely isn't over. People fighting the pipeline aren't ready to concede that this decision marks the end. At the close of Thursday's hearing, VGS attorney William Dodge asked that the PSB decide the park issue in September. He also requested that it shorten the subsequent window for either party to ask the board to reconsider from 10 days to two. "What we're worried about is we're running out of daylight to construct the project," he said. "I don't think we're going to agree to that," said Jim Dumont, an attorney representing Hinesburg residents fighting the eminent domain request, during an interview Friday. He noted that the ability to ask for reconsideration could be key if the PSB makes a decision using an unexpected line of reasoning. Asked if the company could face further legal challenges, Dumont responded, "Oh yes, I think it's likely." After the reconsideration period, parties have 30 days to appeal the whole decision to the Vermont Supreme Court. Dumont said it's also possible that the PSB won't address all of his objections when it issues its ruling. If that's the case, his clients could choose to bring one particular argument to superior court. "I think it's only just beginning," said Rachel Smolker, one of the resident "intervenors" Dumont represents. If the PSB rules against the residents, she wants to appeal. Asked about the implications of the delay that could cause, Rendall responded, "I'm not going to talk about hypotheticals." Pressed further, he said, "It will certainly be a challenge for us if our ability to complete our work under the park is significantly delayed." During the hearing, Vermont Gas vice president Eileen Simollardes said that if the company had to reroute the pipeline around the wetlands in Geprags, it could take more than a year to obtain easement rights and resolve other issues along a new route. 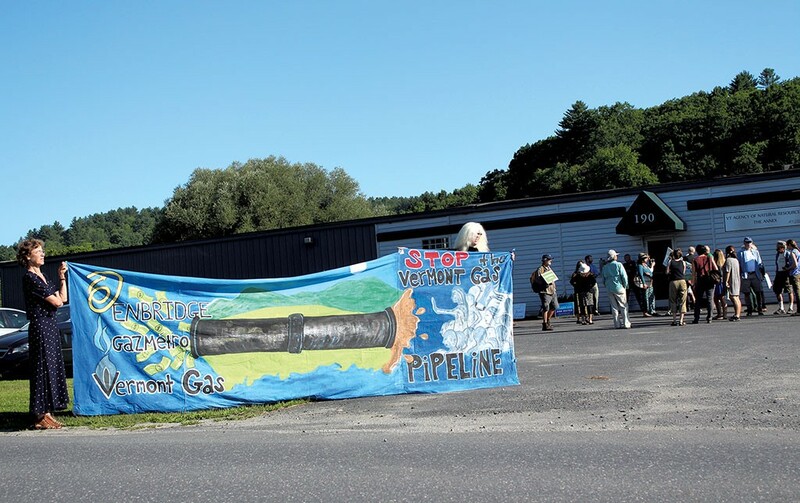 Should Vermont Gas manage to complete all 41 miles of pipeline by the end of the year, it won't mark the end of the fight for Smolker and others. "Even if it was all in the ground, it would still be very worthwhile to halt it," she said, suggesting that they could still try to prevent the company from using the pipeline. She suspects Vermont Gas — or other energy companies — will want to utilize the pipeline corridor to transport fossil fuels through Vermont to larger markets. "This corridor is very likely in the future to grow and become a huge massive superhighway of energy," she said. Proposed in December 2012, the pipeline has encountered pushback at practically every step — from the climate change activists who have chained themselves to construction equipment to the landowners who refused to cede their ground to the gas company. The cost of the project has skyrocketed — from $86 million to $165 million, according to information Vermont Gas filed with the Department of Public Service in June. Much of the media attention has focused on the protesters camping out in trees and locking themselves to backhoes. But despite the human obstacles, Vermont Gas has quietly been making progress. It installed 11 miles of pipeline last year, Rendall said. This summer, roughly 250 construction workers are putting in pipe in Williston, Hinesburg, Monkton and New Haven. They've finished several miles so far, and "many more are nearing completion," according to Rendall. He said the entire pipeline is now under construction — except the 2,000 feet through Geprags — and he expects it will be finished this year. The company recently struck deals with two of the last holdout landowners — in one case, because a woman died, allowing Vermont Gas to negotiate with her heirs. Vermont Gas has now secured rights-of-way from 162 of 163 property owners in the pipeline's path — a feat that cost it about $15.6 million. Negotiating with the 163rd landowner — the Town of Hinesburg — has been harder than expected. 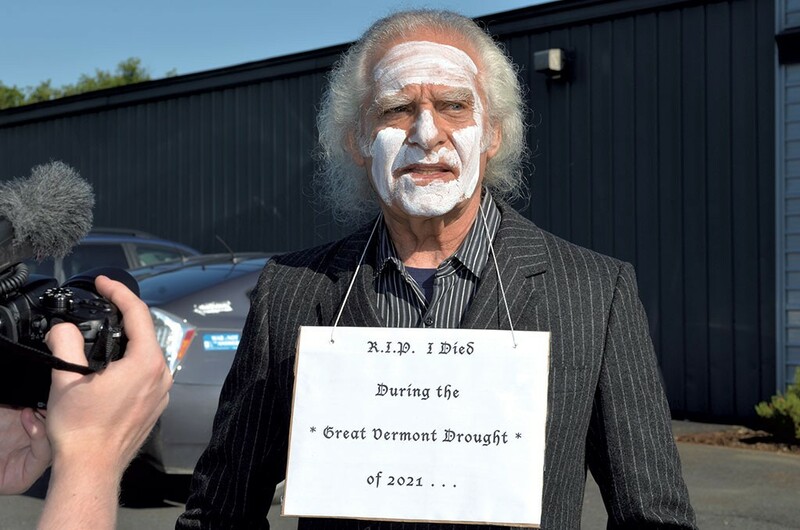 Vermont Gas officials thought they had an agreement with the selectboard, but residents forcefully objected last February, alleging that the board had violated Vermont open meetings law by making the pact behind closed doors. In response, the selectboard retracted its agreement with Vermont Gas and voted 3-2 last month for one with better terms. Vermont Gas would use horizontal directional drilling, instead of digging a trench, to protect the park's wetlands. Sweetening the deal, it would pay $250,000 for easement rights and provide natural gas to 100 or so trailer park residents in Hinesburg. But Vermont law prohibits the selectboard from simply signing over those easement rights. Two sisters bequeathed the parkland to the town on the condition that it be used for recreation or education. That's why Vermont Gas is seeking PSB approval to take it through eminent domain. Seven Hinesburg residents are challenging that approach. While opponents are concerned about the impact on Geprags, many, including at least some of the intervenors, also see this as a strategy to stop the pipeline. Vermont Gas attorneys twice attempted to convince the PSB to revoke the group's intervenor status, which allows them to make their case before the board. When that failed, they tried without success at the start of last Thursday's hearing to persuade the board to throw out nearly all the intervenors' arguments as irrelevant. In the hot, crowded and sometimes tense warehouse room, Dumont, who has represented other pipeline opponents, presented his multipronged case in meticulous detail over the course of six hours. He questioned whether the selectboard's agreement would truly protect the interests of Hinesburg park users, arguing that drilling, while less intrusive, could still damage the surrounding wetlands. He sought to show that the company had failed to adequately explore alternative routes that would bypass the park. And he questioned whether the selectboard even had the authority to enter into such an agreement without going to court. Finally, he argued that Vermont Supreme Court precedent precluded utilities from using eminent domain to seize land already serving a public interest. It's still unclear when the board will determine whether his arguments have merit. Regardless of the outcome, opponents are keenly aware that the Public Service Board might make other pipeline decisions down the road. Vermont Gas originally envisioned a three-part project: this one from Colchester to Middlebury; a second-phase pipeline under Lake Champlain to the International Paper mill in Ticonderoga, N.Y.; and finally, a third phase extending the Middlebury line to Rutland. International Paper was going to help pay for the underwater construction, and when it backed out of the deal in 2015, Vermont Gas stopped pursuing the second phase and put the Rutland link on indefinite hold. Rendall wouldn't say last Friday whether Vermont Gas was still planning to extend the pipeline to Rutland. "We look forward to having the discussion with all of our stakeholders about the future when this project is finished. Right now we're focused on finishing what we started." Asked if his staff is actively exploring plans for a pipeline to Rutland, Rendall replied, "It has taken all of our excellent resources ... to focus on completing this project in a safe and timely and cost-effective way." Members of the Rutland Area Climate Coalition, formed in 2014 by locals opposed to the Keystone XL Pipeline, aren't waiting around for a more definitive answer. "In an effort to be preemptive about that, we have been trying to forewarn landowners between Middlebury and Rutland that they could be in the path of a potential pipeline," said member Beth Thompson. They've sent letters to residents in Leicester, Salisbury, Brandon, Pittsford, Proctor and West Rutland, and gone door-to-door to follow up. Thompson said they're encouraging people to file no-trespass notices against Vermont Gas to prevent the company from scoping out their properties. "What we've got here is a larger demographic than you think that's opposed to this pipeline," she said. Another anti-pipeline activist, Mary Martin, is proof of that assertion. The Cornwall resident didn't believe in climate change when she first started fighting the pipeline several years ago. The pipeline would have gone through her property if Vermont Gas hadn't ditched phase two. By the time that happened, Martin had already been converted to the climate-change cause; since then, she's continued to fight the pipeline for environmental, rather than personal, reasons. "I guess I have Vermont Gas to thank for that," she said. In addition to bolstering the ranks of pipeline opponents, the current project may have other aftereffects. It's been a public relations nightmare for Vermont Gas, and the reputations of the PSB and the Department of Public Service have suffered. Pipeline opponents routinely assert that the regulatory process has been "rigged." A wider range of people, including elected officials, expressed dismay when the PSB attempted to prevent the public from attending the Geprags hearing. That prompted Lisa Barrett, a retired attorney from Huntington with no pipeline-protesting history, to take the board to court for violating her First Amendment rights. After a federal judge ordered that the hearing should be open, the PSB attracted more ire by announcing that the room it had reserved had space for just six members of the public and seven members of the media. At the start of the meeting last Thursday, Barrett stood up and asked the PSB to move to a larger venue, but her request went unacknowledged. Martin had left home at 5:30 a.m. — in a recently purchased Prius — to wait in line for one of the six spots. She made it in. "My husband calls me Pollyanna," she acknowledged. But, she said, "I don't think it's the end." The original print version of this article was headlined "Vermont Gas Pipeline Foes Vow to Keep Fighting"